That moment of dread when your little angel tells you the part they've been given in the school nativity. "I'm a camel mummy!". "A camel?" you say, raising an eyebrow and feigning a smile. "Wow! That's great!" you say, through gritted teeth, while thinking, "How the hell am I going to make a camel costume?!". Of course, I could just buy one, but I do secretly, nay openly, enjoy making these kinds of things, and I am also congratulating myself that the teachers giving me this challenge is a testament to the Buzz Lightyear wings I made a few weeks ago. More on that later. 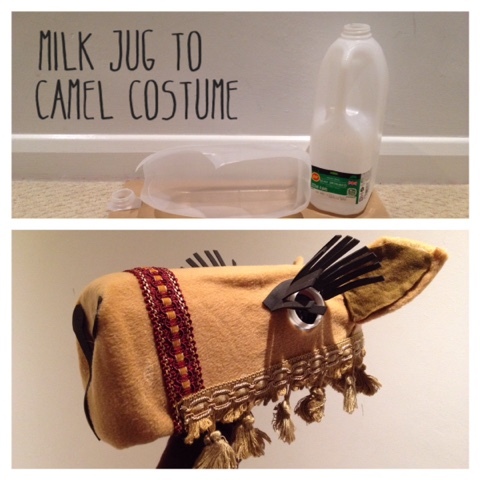 So if you find yourself in a situation where you need to make a camel costume. This is how you do it. 1. 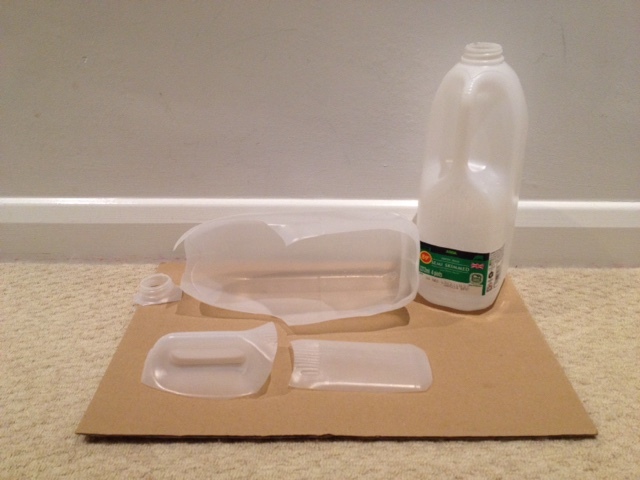 To make the head cut the neck and handles off both the milk jugs as shown. Also cut away the remaining flat part from the side where the handle was. Choose one of the jugs to turn into your head piece. 2. 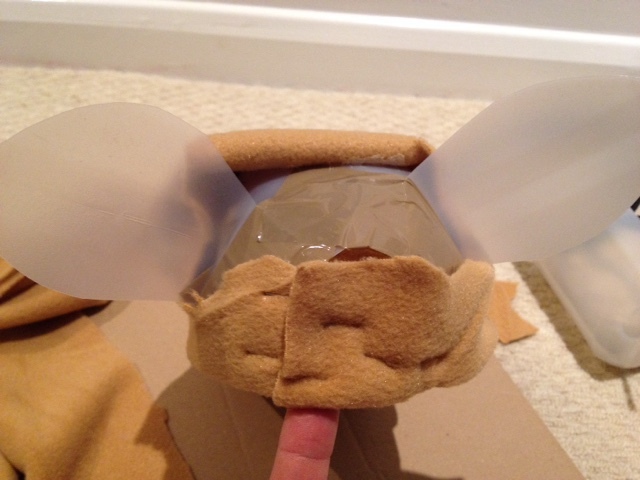 To make the ears take the two flat parts of plastic and cut them into ear shapes. 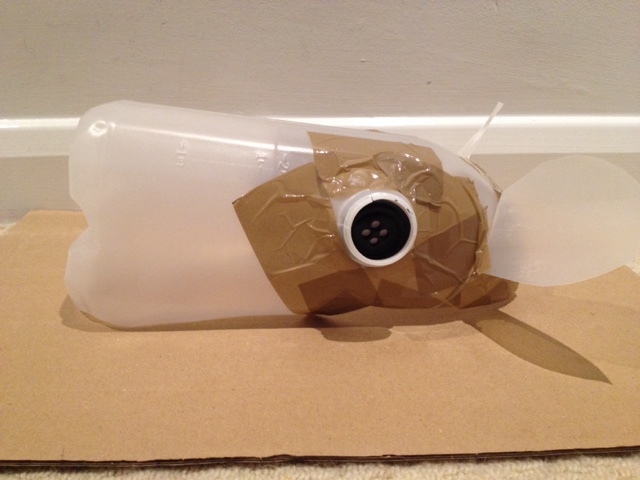 Bend a sharp flap at the bottom to use to stick the ears to the head as shown, using the packing tape. 3. 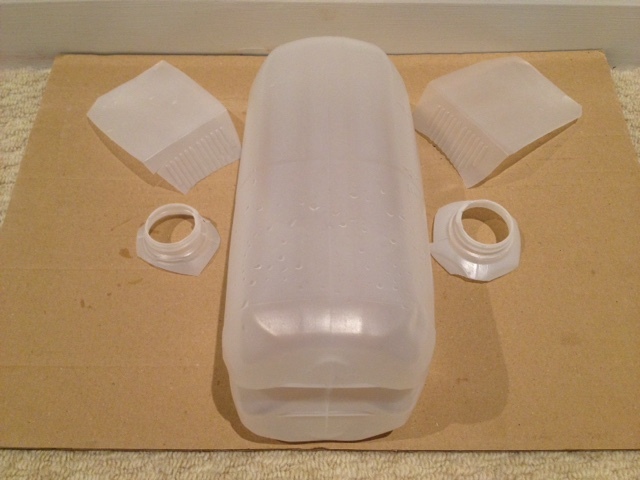 To make the eyes cut black foam or card to the size of the inner circle of the necks of the jug. Alternatively, if you happen to have large buttons that fit like I did, you could use them. Glue them on the sides of the head then use more packing tape to secure the necks of the jugs on top to make the eyelids or socket shapes. 4. Cover with material. 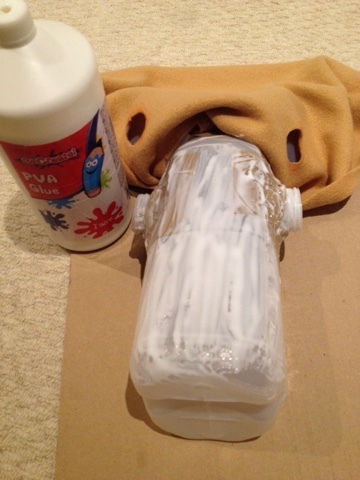 Use a combination of staples, PVA and/or your hot glue gun to stick the camel coloured material around the head. The way I did this was to drape it over and mark the shape of the eyes by running a pen around the circle of the eye sockets. 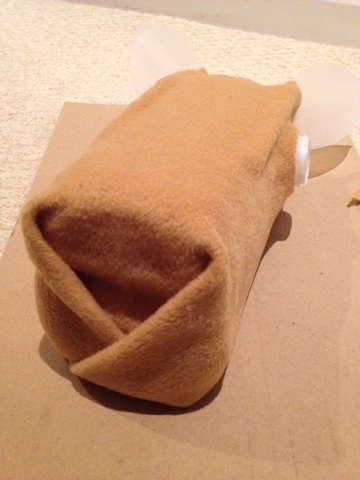 Then you can cut the holes for the eyes, which will hold the material in place while you cut around the ears etc. 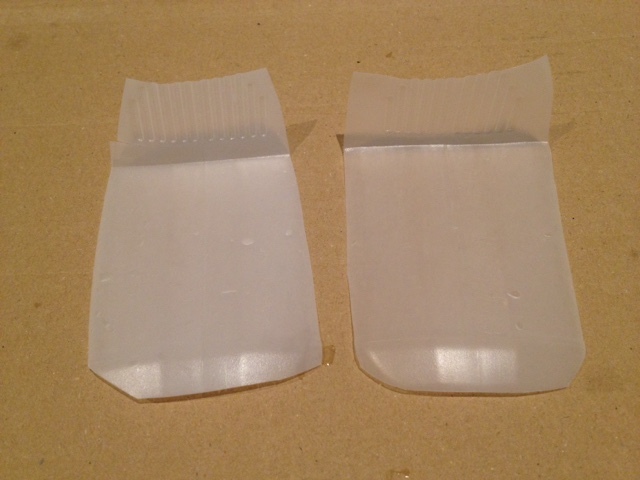 Leave a good amount of material to fold under the rim of the head piece and secure with glue inside. This will help with a snug and comfortable fit on the head. Fold any excess material around the nose a bit like you would fold corners of a bed sheet, to give the contours of the nose and mouth. 5. Cut more material to cover the front and back of the ears. Glue down. Cut a smaller ear shape from a darker piece of material to make the inner ear. Glue down. 6. 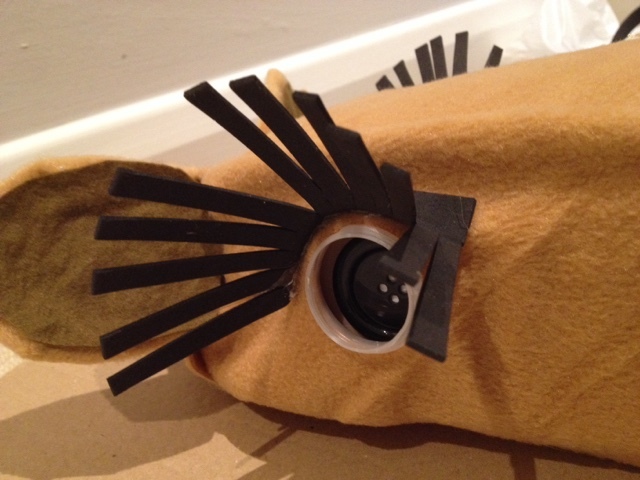 To make the eyelashes - a really important feature of the camel - I used rectangle strips of black craft foam, and cut thin strips part way down like a comb, then bent these back and stuck them around the top of the eye socket. Black card would work just as well and before I found the craft foam I thought about using half a toilet roll and painting it black. 7. 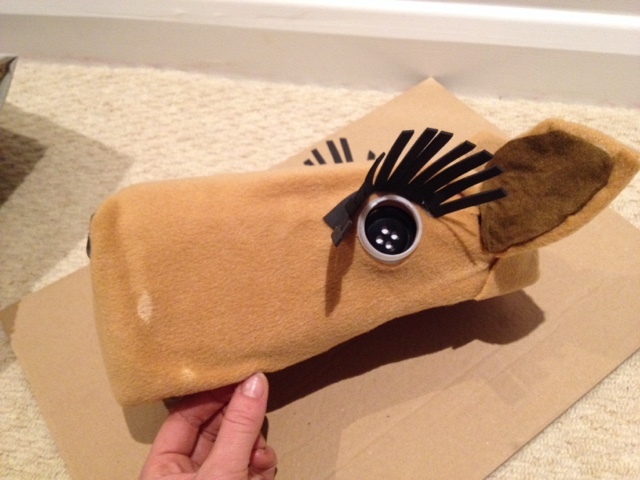 To make the nose and mouth detail cut a three-pronged strip of foam or black card and stick with glue. 8. 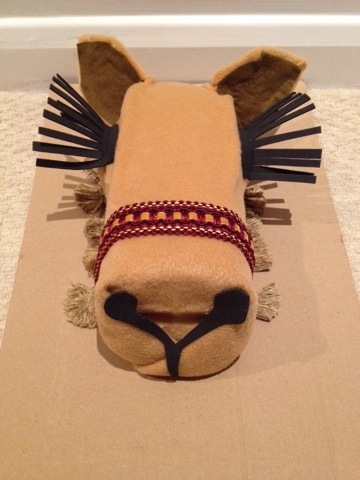 To make the reins glue your chosen curtain tassels around the bottom of the camel head and some braiding across the nose. This really gives an impressive finishing touch to the camel's head. 9. 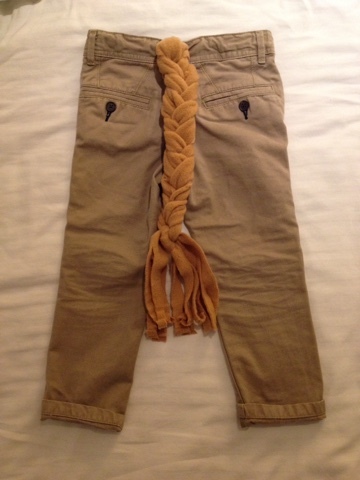 For the legs I tied on a tail to an old pair of trousers. 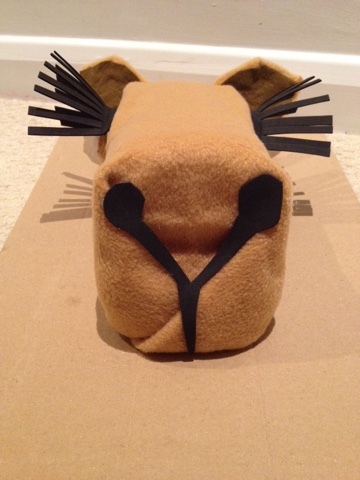 I made the tail by plaiting strips of the same camel-coloured material. 10. 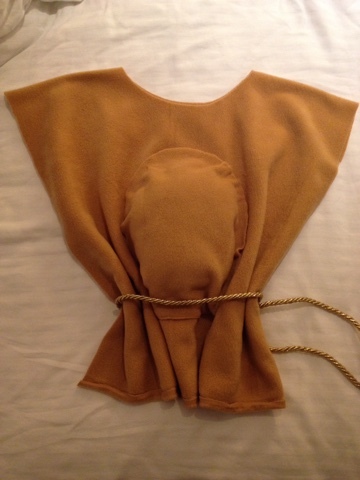 For the body I made a simple no-sew tabard. Fold a rectangle of material in half (about 60cm x 100cm for my 4 year old), and cut a hole in the centre of the fold for the child's head to go through. For the hump cut an oval shaped piece of material (about 30cm x 20cm), place a handful of pillow stuffing underneath and glue it on round the edges to the back of the tabard. Secure the tabard to the child by tying a length of braid round the waist. And that's it! No picture of the whole shebang yet as we had to get it down to the school for dress rehearsal etc. I am pretty pleased with my efforts and I hope this gives some inspiration if you are ever stuck in the same delightful predicament. best mince pie recipe ever! Got into the kitchen for a (these days) rare baking sesh on Sunday. It was triggered by eating a packet of disappointing store-bought mince pies, and needing to remember that home made ones are much much better. Especially my home made ones. The texture of the pastry is so incredibly light and crumbly, and the flavour rich and buttery - the perfect indulgent Christmas treat. 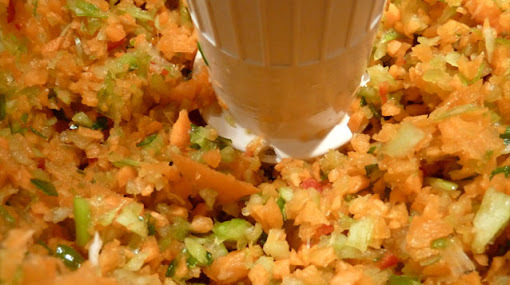 I've used this recipe for years and, with a bit of Google detective work, I was surprised to find that it is still kicking about on t'internet, 10 years after it was published! 1. Preheat the oven to Gas6/200°C/180°C(fan) and grease a 12 holed bun tin. 2. Rub the butter into the flour with your fingertips to make 'breadcrumbs'. 3. Stir in the sugar (I just use normal caster sugar), and a pinch of salt. 4. Using just the heat of your hands bring the dough together into a ball, or say 3 smaller balls (I've found that the mixture is so crumbly it doesn't hold together in big balls very easily). 5. Take walnut sized pieces of the dough, and again, using the heat of your hands, press them into the palm of your hands to make the pastry base, and press this into the bottom of the bun moulds. It can still be quite crumbly, so you might have to do a bit of patching here, but don't worry, it will come together. 6. Add a teaspoon or so of mincemeat to each base, then press out smaller pieces of pastry for the lids. In my experience the lids don't need to be attached very securely, so just do your best to press on. Brush lids with beaten egg. 7. Bake for 20 minutes and enjoy the Christmas smell pervading your home. 8. I tend to leave the pies in the tins a bit longer than the 5 minutes the recipe recommends, as I find they come out easier, say 10-15. Then place on a wire rack to cool. If there's one thing that can motivate anyone to make a quick meal, it's a hungry pregnant woman. In this, Episode 2 from Series 1 (watch here on 4OD) Jamie explains that this recipe was invented when a pregnant Jools Oliver wanted pasta with ragu sauce and she wanted it NOW! 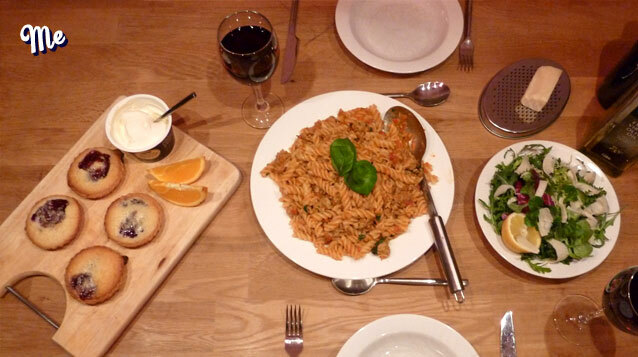 I love pasta and often knock up pasta sauces from bare looking store cupboards. It's the ultimate quick, easy, not to mention totally scrumptious meal, so the half hour target should be no problem at all. As usual, I get all the equipment ready: food processor out, pans and boards out, kettle on. The first thing to prep is the veg for the ragu, and I love Jamie's way of just whacking it all in a food processor - 3 carrots with the ends off (no need to peel), 5 spring onions trimmed, 2 sticks celery with the ends cut off, and 1 whole red chilli. Thirty seconds and it's done, blitzed with in an inch of it's life. It goes into a hot pan with a splash of olive oil. Next I process 6 good quality pork sausages, and a heaped teaspoon each of fennel seeds and dried oregano. According to Jamie, this is going to give me real "pimpage" when it comes to flavour. In putting the sausage mix into the pan I find that it kind of clumps together, and try as I might to break it up with a spoon, it still seems lumpier than I'd like. Never mind... plough on. To the puddings! I do like it when a 30 Minute Meal includes a pudding - it always seems more impressive to pull off multiple courses in 30 mins rather than one dish with sides. Jamie uses ready made mini-tart casings, as do I. Nothing wrong with that. And he fills them with the easiest tart filling in. the. world. In a bowl I mix 100g butter, 100g sugar, 100g ground almonds, 1 egg, a pinch of salt, 1 tea spoon vanilla extract, and the zest of half an orange. Fill each pastry case first with a teaspoon of raspberry jam then a teaspoon of frangipane mix, then another teaspoon of jam and another tea spoon of frangipane, so that it gives a marbled effect when cooked. Pop it in the oven for 18 mins at 180-190C. At this juncture Jamie is at 10 minutes, I am at 12. Not bad. I fill my pasta pan with the boiled kettle water and season. As Jamie wisely advises, "if you don't season your pasta it will taste like thin air". Then my pasta goes in (I add enough for 2 people, but the rest of this recipe serves 4-6). Now back to the ragu sauce. 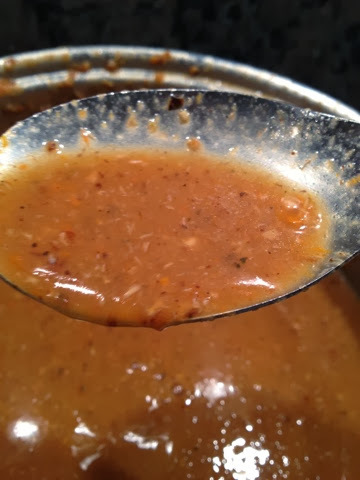 I add 4 tblsp balsaminc vinegar, a couple of cloves of crushed garlic (I chop it up this week rather than struggle with my darned cheapo crusher), and when the balsamic has evaporated off a bit, I add 1 tin of plum tomatoes. It is kept on a high heat to boil down and thicken up. Jamie is up to 19 minutes now and I have caught up - this is looking positive. So onto the salad. Jamie uses red chicory but as usual, fancy leaves like this are not available in Asda, so I've just got my bog standard bag of washed mixed leaves. I pile onto the serving plate, sprinkle with sea salt and delicate shavings of parmesan, then take to the table with lemon wedges and olive oil for self-dressing. The penultimate task is to get the pasta together. There is way too much sauce for two people's needs, so I set some aside for another night. Then I do as Jamie says and before draining the pasta I scoop out a mug of the starchy cooking liquor. Once drained the pasta goes into the ragu and is tossed together with some of the cooking water to loosen up the sauce. 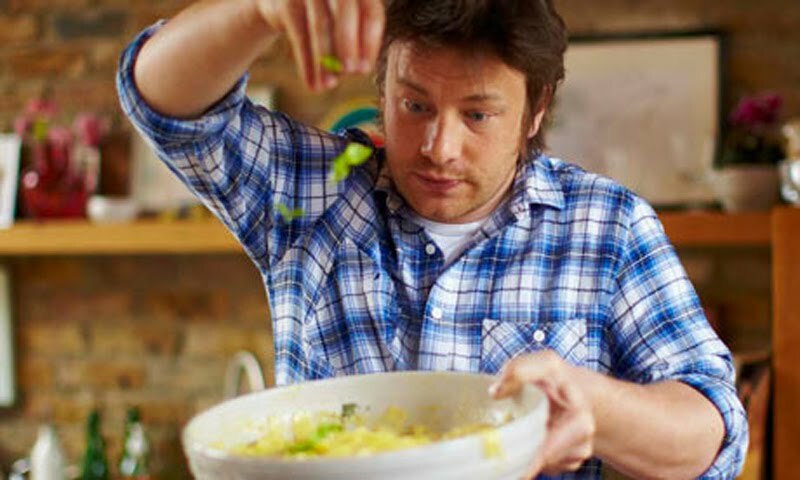 Jamie adds chopped Greek or globe basil but again, this is unheard of at Asda, so I stir through a handful of chopped normal fresh basil before plating up and taking to the table along with a block of parmesan and a grater. Finally, my frangipane tarts come out of the oven and onto a board with creme fraiche and orange wedges on the side. And as Gordon Ramsey would say, "Done!" Delays encountered: None, but I did take my butter for the frangipane mix out of the fridge an hour or so before to soften. If I hadn't done this, dealing with hard butter might have cost me a few mins. The verdict? Well, a pleasure to cook, and less pressure timing wise than the other meals I've tried so far. The fennel seeds were the signature flavour in the pasta, very tasty indeed. However, it did suffer texture-wise from lumpy sausage meat. The salad was average, but I blame myself with my substitute leaves. But the real star of the show this week, and definitely going on the list of things to cook again, are the frangipane tarts. Seriously, absolutely heavenly...melt in the mouth... Jamie, you are a genius. Next week on Thirty Minute Thursdays: sea bass and crispy pancetta, with sweet potato mash, asian greens, one-minute berry ice cream and sparkling lemon ginger drink. 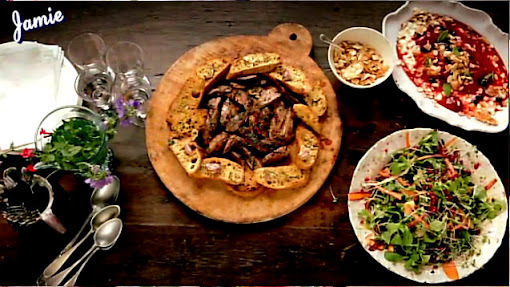 After the success of last week's duck salad, I was really looking forward to trying out my next 30 minute meal, and to save me having to make decisions about which to cook next, I've decided to work through the TV series in episode order. So this is Series 1, Episode 1 if you want to watch it online over at 4OD. Let's begin! Determined not to make the same mistakes as last week, I make sure I have not only my pans out, oven on, and kettle boiling, but also as many of my ingredients laid out in advance as possible: I've rooted through my spice cupboard, and collected the required rosemary from the garden all before 'starting the clock'. Hmm, isn't this cheating a little bit Jamie? Oh well, *shrugs*, with my worktops littered with ingredients I seem to have already made progress on last week, achieving the kitchen bomb site stage much earlier in the cooking process, (in other words, before I've even begun). The chicken breasts (1 each) are seasoned with salt, pepper and olive oil and placed skin side down in the hot griddle pan. I then blend up 4 spring onions, 5 garlic cloves (but experience the same delay as last week with my blunt crusher), 1 whole chilli (rather than scotch bonnets with the seeds removed), dried thyme and a dried bay leaf (don't have any fresh), a level teaspoon each of all spice, nutmeg and ground cloves, 6 tablespoons of rum, 3 tablespoons white wine vinegar, salt, pepper, 3 tablespoons of olive oil and about a tablespoon of brown sugar (improvising as I kick myself for forgetting to buy honey). My chicken skin is looking crispy now, so I put it in an oven dish, and pour over the sauce. This is a mistake - I was supposed to lay the chicken into the sauce, leaving the skin uncoated to keep crisp. 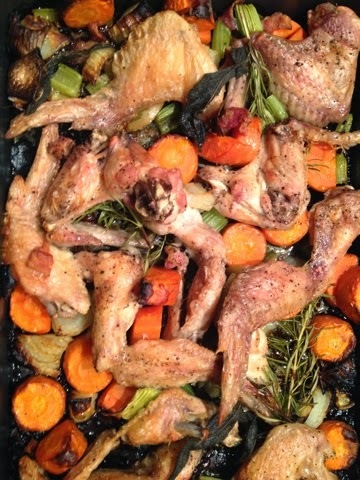 I then forget to top this with the fresh rosemary sprigs I had painstakingly pre-collected, and put the chicken in the oven at 200c. My cobs of corn (1 each) go into a pan of boiling water, and we're 10 minutes in - on schedule! Now to make the rice and beans. I use scissors to cut 2 spring onions into a little oil in a thick bottomed pan. In goes a cinnamon stick (v. impressed with myself for having some of these in the back of the spice cupboard), salt and pepper and enough rice for two people (Jamie recommends 250g for four). I don't have the fancy pots of ready made fresh stock, so I crumble in a stock cube and cover the lot with boiling water. Jamie then adds in black beans, but my Asda didn't sell them, so I used a tin of borlotti beans I had in the cupboard, er because, they looked darkish in colour on the tin! Please don't judge me Jamie! Lid on, full heat. Jamie's half way and happily, I'm only a couple of minutes behind him. Next, into a bowl goes half a tub natural yoghurt, chopped coriander, salt and pepper and the juice of 1 lime. 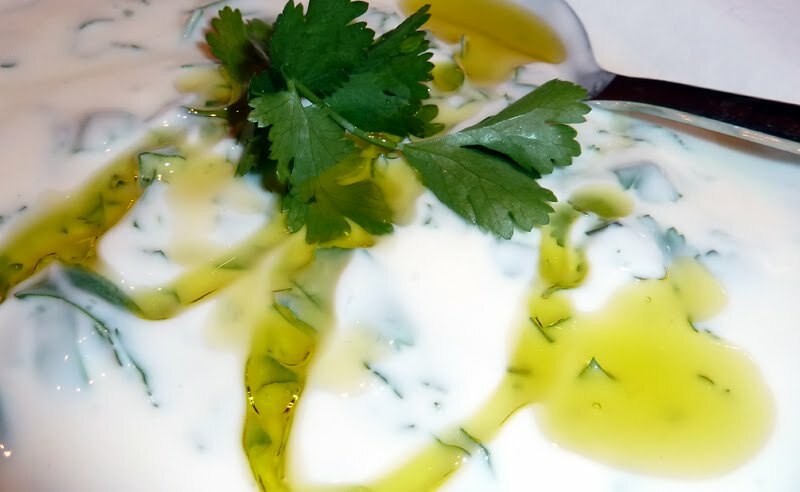 I garnish with coriander and the ubiquitous Jamie drizzle of olive oil. The cooling yoghurt is the first thing on the table. The corn comes out of the water and into the griddle pan that had the chicken in it, for charring. Now for the chopped salad, and for some reason, (perhaps cocksure and complacent having got two elements on the table already), this is where I start to slow down. I chop up a red pepper, a couple of handfuls of mixed bagged salad, and more coriander onto a board. Jamie suggests that I "embrace whatever's down the market" so I don't feel too bad about using the bagged salad instead of his elusive chicory. I'm making a mess as the greenery tumbles over the edge of the board, but Jamie says mess is okay. Happy days! As instructed, I make a well in the middle of the heap and grate in a small piece of onion (messy and a bit fiddly), about 2 tablespoons of olive oil, the juice of half a lime and a pich of salt, then using my "fairy fingers" I dress the salad. Jamie says it'll fall everywhere, and it does. Finally, I cut some cress onto the top. Jamie's at about 21 minutes, I'm at 26, but I still think I can make the finish line in 30. Time to dish the corn. I don't manage to get it quite as nicely blackened as Jamie, but it'll do. 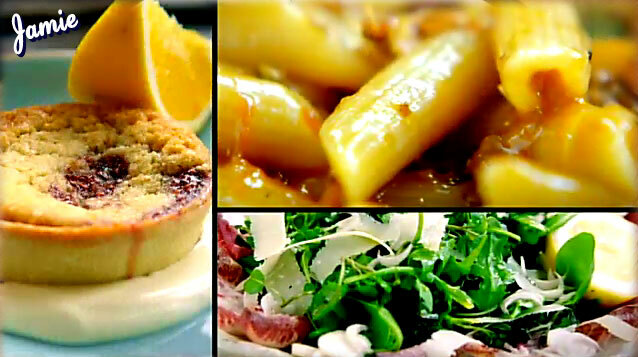 It goes on to a plate with a squeeze of lime and yes... you've guessed it, a drizzle of olive oil, to "make it sing". The rice is ready, so I fluff it up with a fork and sprinkle with coriander before taking to the table. The chicken comes out, and I kick myself again for not having any honey to drizzle over, as I think it would have been a nice touch. And that's it, done! In pretty much 30 minutes... well 33 to be exact. A lot less time than it took to clean up! So, the whole shebang looked fairly comparable to Jamie's but the taste? Well, it didn't blow me away. 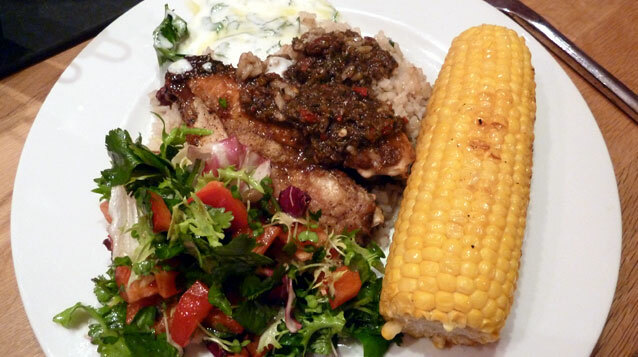 The chicken was pungent and fire-in-mouth hot, making the yoghurt a necessary and welcome cooling accompaniment. The salad was nothing startling. The corn was er... corn. 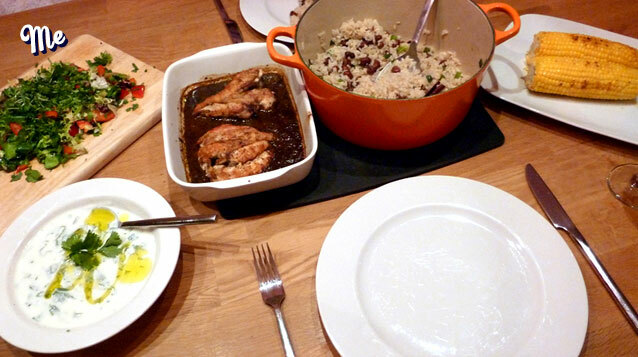 My favourite part of the dish was probably the rice and beans - the spices and cinnamon turned what can often be a bland support act into a fragrant and flavoursome starring role. Would I make it again? Honestly, no. Just not my cup of tea. 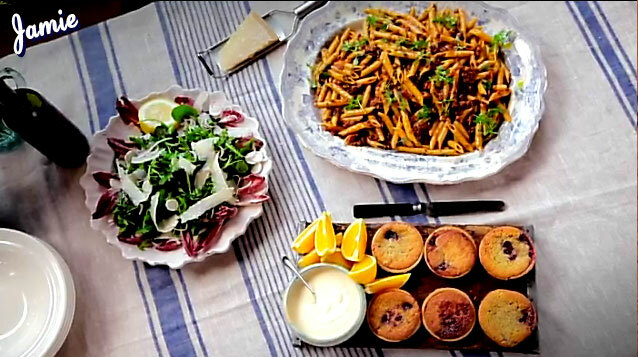 Next week on Thirty Minute Thursdays: 'Pregnant Jools's Pasta' with crunchy chicory and watercress salad, and little frangipane tarts. Here we go! Now, I consider myself to be a fast cook. Almost none of my weekday meals take longer than 30 minutes, so I should be able to bash out these Jamie meals with no problem at all (confidence is everything ;)). 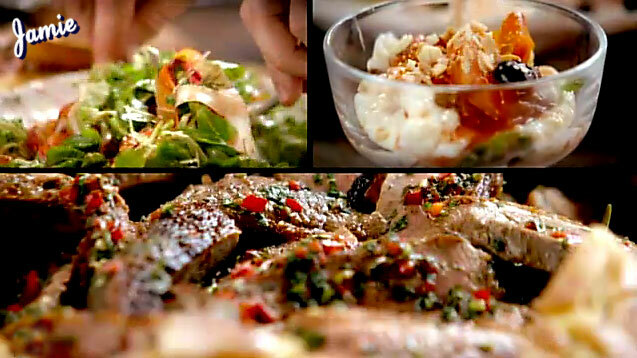 For my first foray, I've chosen to make duck salad, which is Series 1, Episode 6. Watch here on 4OD. Oven on, pans out, and we begin. The duck breasts are given a quick massage with salt, pepper, 5-spice, dried thyme and oil, the skin is scored and they go skin-side down into a hot pan with oil and are weighed down with a flat pan lid and my pestle and mortar. Flaked almonds are washed and coated in icing sugar, spread in an oiled dish and popped into the oven. We are supposed to be about 6 mins in. Yes, on track. My over-sized croutons are cut from a ciabatta and laid into another baking dish with a drizzle of oil, salt and pepper. Fennel seeds... where are they?! Have to work my way through my spice cupboard to find the jar, and sprinkle them over. 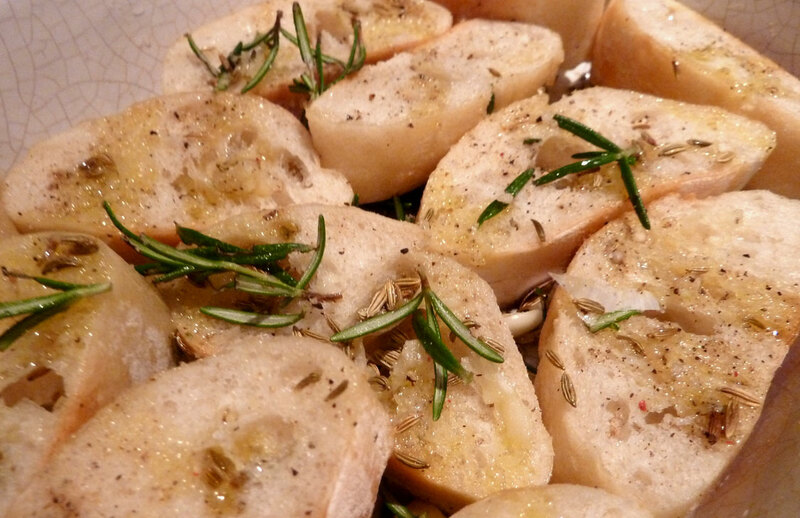 I realise I need rosemary. "HUSBAND!" *flutters eyelashes* "Can you go out into the cold rainy night and cut me some rosemary?" (He's so good to me). The rosemary isn't looking too healthy, so I pick out what I can and sprinkle over. Then, I add garlic cloves - some crushed, some whole, but our stupid garlic crusher is not as fancy as Jamie's, and I have to fiddle around trying to squeeze enough garlic out. These delays have cost me at least 5 minutes and by the time I have got the croutons in the oven and turned my duck I am looking at 15 minutes gone as opposed to Jamie's 10. Now to start the dessert. The orange zest and orange juice go into a pan with vanilla paste. I don't use paste but decide to use some vanilla pods that my sister had brought back from Mauritius. I had been waiting for an opportunity to use them and that opportunity was now. But, alas, I had waited too long - they'd gone mouldy! I salvaged what seeds I could from the clean looking pods and binned the rest. Another delay. For his stewed fruit Jamie uses beautifully ripe looking peaches, nectarines and plums and stones and cuts them into the pan with ease. I only had plums and couldn't work as fast as him at removing the stones... tick tock tick tock. The kitchen looks like a bomb site and the pressure is mounting. According to Jamie we should be just over halfway at this point. I'm at about 25 minutes, almost 10 minutes too slow! I take out the almonds, ruffle them up a bit, and leave them on the side to crisp up. Now onto the salad. Pomegranate is cut in half and the seeds are banged out into my serving dish and any "piff" (sp. pith) as Jamie calls it, is picked out. 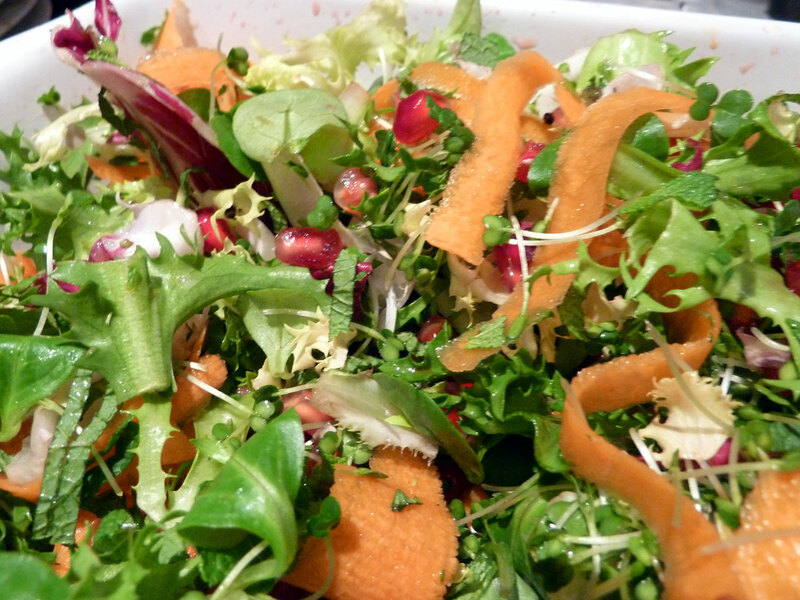 A handful of ready prepped salad leaves are piled on, topped with cress, chopped mint and shavings of carrot. Dressing: oil, balsamic vinegar, 1/2 lemon, pinch salt and pepper, stir. 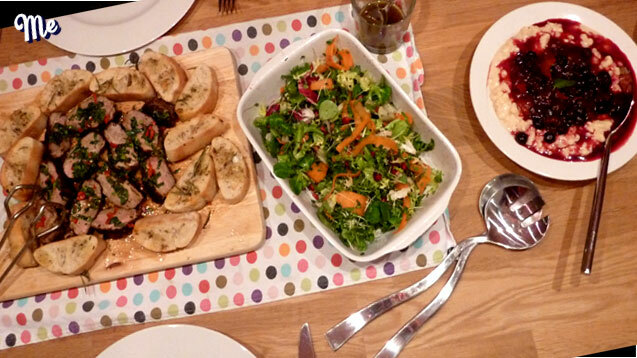 I suddenly get a sense of achievement from placing the first finished element of the meal, the salad, on the table. I've been moving at serious pace now, but we are behind - 33 minutes in, Jamie says we should be on 20 minutes! I put the duck on its serving board to rest (probably overdone by now, but Jamie says he's bored of rare meat) and add blueberries to my stewed fruit, which I have to say is smelling amazing. 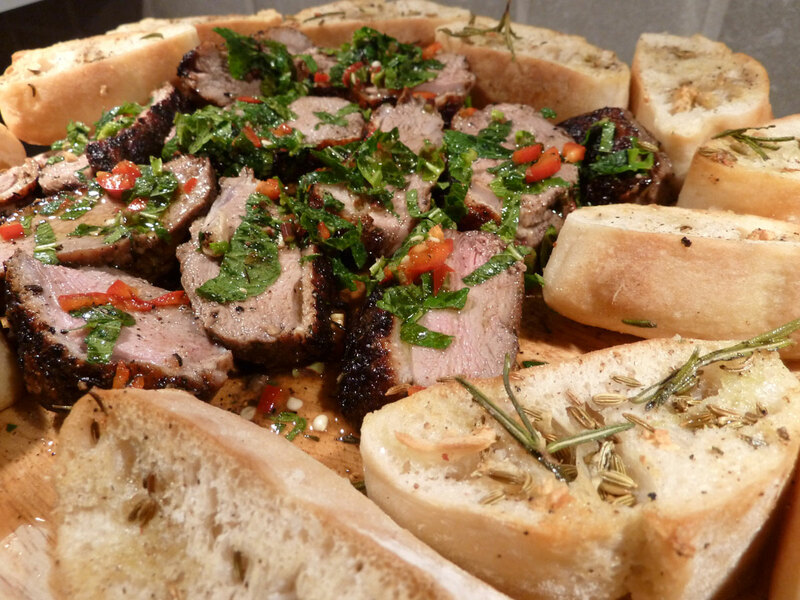 I slice some mint and a chilli onto the duck board, and keep some aside for the top. With the remainder I squeeze on 1/2 lemon, olive oil, salt, pepper and swizzle around the board. 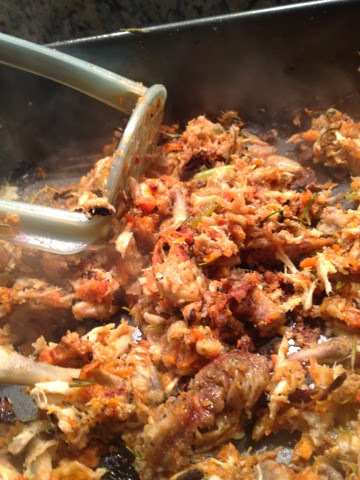 Then I thickly slice the duck and use the them to mop up the minty chilli goodness. The croutons come out the oven and go on the board around the duck to soak up the juices and keep them from spilling off the sides. The duck goes on the table - yay! For the rice pudding I use the old classic Ambrosia tinned rice, rather than Jamie's fancy organic tubs, pour it into a bowl, top with the delicious fruit, a sprig of mint to look cheffy, and off to the table it goes. We're done! Delays encountered: searching my herb cupboard, dealing with dead-looking rosemary, blunt garlic crusher, slow chopping, washing hands after handling meat, chilli, fruit etc (you never see Jamie do this) and mouldy vanilla pods. Well it certainly looks convincing, but how did it taste? Quite frankly, out of this world. The duck was perfectly pink and extra juicy as it had absorbed the lemon and oil, and it was zingy with lemon and chilli. 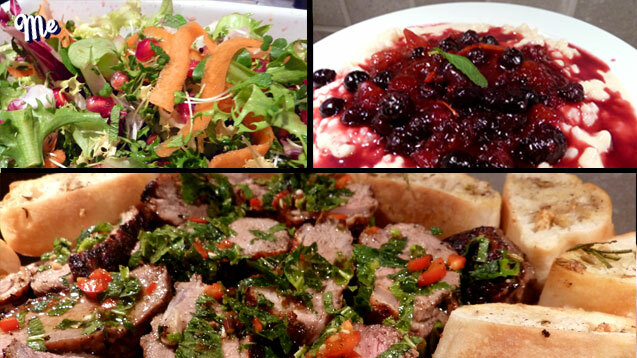 We loved the pomegranate in the salad, and the pudding... oh boy the pudding. Who knew that humble old tinned rice pudding could taste so damn good? The stewed fruits were tart and fragrant with the orange and vanilla, and although I had my doubts about the cold rice it was the perfect creamy, silky accompaniment. Annoyingly, I forgot to top my dessert with the crunchy almonds, but we picked on them afterwards while digesting the whole experience, and they were actually the most surprisingly good part of the meal, so simple, but such a gorgeous sweet nutty taste and light and crunchy. I will definitely be making the dessert again, and despite the over-run on timing, this would make a perfect and impressive meal for dinner with friends. 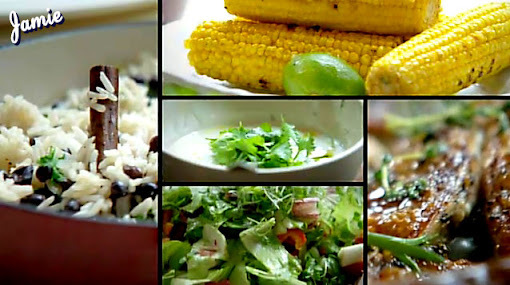 Next week on Thirty Minute Thursdays: killer jerk chicken, with rice and beans, refreshing chopped salad and chargrilled corn. 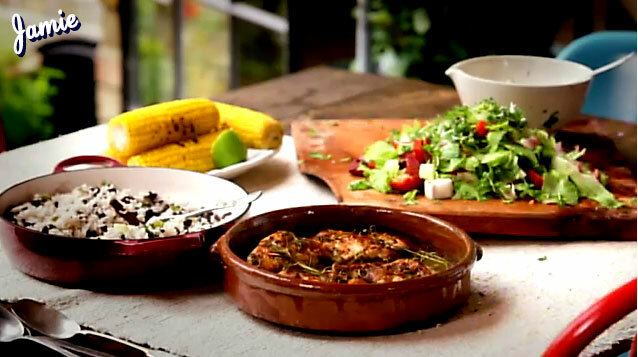 Over the next few months I've set myself a challenge of cooking one of Jamie Oliver's 30 Minute Meals per week and I'll be publishing the results on this blog every Thursday, in the aptly titled: Thirty Minute Thursdays. I'll fess up right now to not having bought the book. Instead I'll be working off some roughly scribbled notes from the TV series. All 40 episodes from series 1 can be viewed here on 4OD. I'm hoping that making notes on the show will commit the recipes to memory and help me hit the 30 minute target rather than waste time referring to a recipe book. 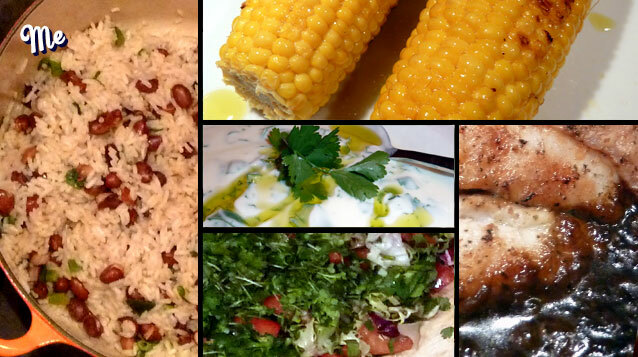 The Guardian has four testers try out four different meals with consistently dismal results. Criticism as expected from another four testers at the Daily Mail. 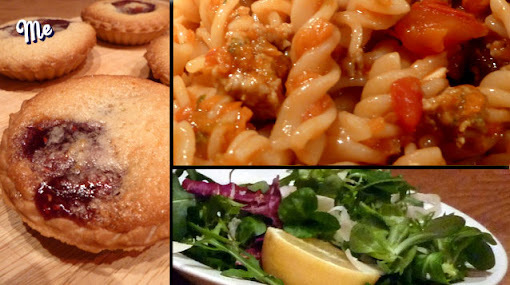 A slightly fairer commentary from Foodepedia, but negativity again from Moveable Feast. Finally, a satisfied customer at The Hungry Boyfriend.